I am sure the blog-o-sphere is blowing up over this whole thing, and rightly so! Us little guys have to hold onto the free speech we all love so much! I agree with those people saying that this is an awful precedent to set and that the concept of free speech should not be compromised. So what happens next? SNL skits get yanked? Comic books pulled off shelves? LIGHTEN UP PEOPLE!! Personally I think it’s a couple of teenagers in Des Moines that hacked Sony and they’re laughing at the rest of the world. What if I do a cartoon of me shooting an arrow through his head? Will he come after me? Will the Secret Service show up at my door? If you don’t hear from me for a few days… send the Marines. I wouldn’t be surprised to learn that it’s all part of Sony’s marketing plan and that they are hoping all this publicity creates a huge opening weekend. Opening a movie on Christmas Day is always risky as it is one of the biggest box office release days. Hey there, Sparky! Looks like a rotten movie anyway… but now everyone will want to try and see it. I bet pirated copies are already being sold outside Grand Central Station. 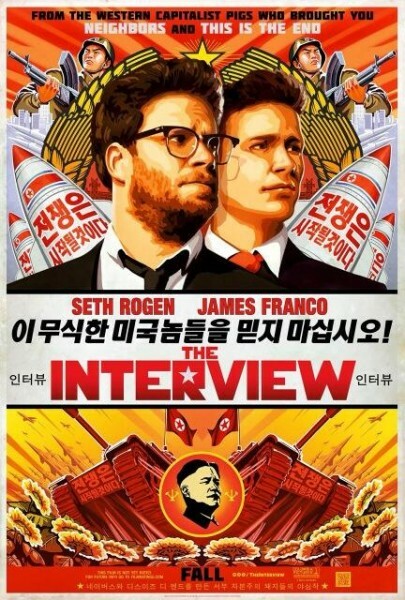 Best publicity a movie could ever hope for–millions of dollars worth of free marketing. It’ll be a cult classic before it even hits the screens. But why would anyone watch anything with Seth Rogen in it?